Fiber cement boards make a great finished product for several reasons but turning them into the finished product is a little tricky. 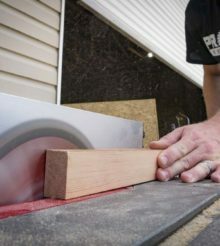 You can imagine the damage that a cement-based plank can inflict on a blade’s cutting edge and the dust cloud created is hazardous to your health. So what do you do? Well besides protecting yourself from respirable particles, you turn to the the name synonymous with outstanding circular blades – Diablo. The Diablo 10-Inch HardieBlade is the only blade approved by James Hardie for cutting Hardieboard, so I had high hopes for it. I took the blade to a construction job in Lakeland, Florida for testing. We decided to use Hardieboard for the exterior trim on a new church building I was contracted to help with. The obvious benefit is weather resistance in this humid sub-tropical environment. It should alleviate the headaches that come when wood trim begins to rot down the road. The 10-inch diameter is made for table saws, but works well on a 10-inch miter saw. It also comes in 7-1/4-inch and 12-inch models for circular saws and chop/miter saws. Some fiber cement blades look very similar to any other blade you’ve ever used, but many of them – like the Diablo – look odd with very few teeth and fairly large gullets. Each of the blade’s teeth are tipped with polycrystalline diamond and then spark-eroded to make what must be the most remarkably durable blade I’ve ever used. In fact, Diablo claims to get up to 60 times the life compared to standard carbide tipped blades in fiber cement applications. Dust generation is down by up to 5% with the Diablo 10-Inch HardieBlade. That may not sound like much, but every little bit helps. You’ll still want to be sure and take advantage of a dust extractor while using it and be sure you have proper personal protection equipment (PPE) on. In addition to your health, you never know when OSHA might make an unannounced site visit. The kerf is pretty thin and makes a sharp, clean cut in the board. It can even cut stacked boards. I was able to get accurate bevel cuts within the tolerances I needed for the trim work. The blade benefits from Diablo’s non-stick coating. While you will see it rub off, it won’t get gummy and bind things up from the heat generated by cutting. The Diablo 10-Inch HardieBlade really made my job easy. Circular blades can get pricey, but at less than $90, this blade might be the most affordable per linear foot that you can buy. That’s Diablo’s whole point. You’re not paying a premium to get just a little more cutting life out of the blade – you get tremendous life compared to competing blades. Over the long term, it’s much cheaper per linear foot of cutting to go with Diablo. It cuts quickly, cleanly, and easily and I highly recommend it. Leon started work for a large mining company, welding for several years and then moving to the carpentry shop for more than a decade. Following his retirement from, he started remodeling and has been doing that ever since.